Liar, Temptress, Soldier, Spy is a nonfiction book that tells the stories about 4 women and their roles in the Civil War. These were 4 amazing women – though I feel rather unpatriotic saying that two spies for the confederacy were amazing. But they were all four incredibly brave and strong in their convictions. Abbott claims in the introduction that she’ll use only primary source material though she did deviate from that at times and put herself into each woman’s mind. I don’t remember ever reading anything about roles that women actively took in the Civil War. The sheer audacity of Rose Greenhow, Emma Edmonds, Elizabeth Van Lew and Belle Boyd was just astounding to me. I honestly was expecting Belle Boyd to be shot in the first scene described in the book – when she pulled a gun on Union soldiers threatening her mother – how her poor mother survived hearing about her exploits throughout the war I do not know. I was terrified reading Emma Edmonds’ stories of a woman dressed as a man and fighting for the North. I was so sure she would be discovered at any moment. Rose Greenhow and Elizabeth Van Lew were on opposing sides but they both put their love of their country above all else. I loved the way Abbott changed perspectives between the women throughout the book, yet always stayed in the same window of time relating to the war. I really have not read a lot about the Civil War since mandatory reading in history class, and I had forgotten what I had learned about the scale of the war in bloodshed and death. Reading the sections about Emma Edmonds (the soldier of the title), definitely reinforced the reality of the war. Its particularly jarring when you’re reading about the bloody deaths in contrast to the parties taking outings from Washington to watch the battles. The number of bodies and the horrific wounds these men (and women) endured is just astounding. Clearly I need to visit my new brother-in-law for a tour of some Civil War battlefields and education. Interestingly enough, when Holly and J were married this summer they took us on a private tour of the canals of Richmond. The tour guide actually mentioned Elizabeth Van Lew and how helpful she was to the Union. I loved having that personal reference while reading this book! If like me, you haven’t read a whole lot about the Civil War this is a fantastic book to get a wide range of stories from both the North and South perspective. The changing perspectives made this book read quickly and kept me waiting to catch up with each of the women. The experiences that these women lived through are brought to life by Karen Abbott and are beyond any fictional tale I can think of. Thank you Harper and edelweiss for this advance copy in exchange for an honest review. Varina Anne “Winnie” Davis was born into a war-torn South in June of 1864, the youngest daughter of Confederate President Jefferson Davis and his second wife, Varina Howell Davis. Born only a month after the death of beloved Confederate hero General J.E.B. Stuart during a string of Confederate victories, Winnie’s birth was hailed as a blessing by war-weary Southerners. They felt her arrival was a good omen signifying future victory. But after the Confederacy’s ultimate defeat in the Civil War, Winnie would spend her early life as a genteel refugee and a European expatriate abroad. After returning to the South from German boarding school, Winnie was christened the “Daughter of the Confederacy” in 1886. This role was bestowed upon her by a Southern culture trying to sublimate its war losses. Particularly idolized by Confederate Veterans and the United Daughters of the Confederacy, Winnie became an icon of the Lost Cause, eclipsing even her father Jefferson in popularity. 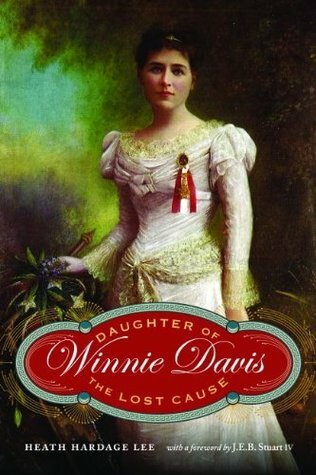 Winnie Davis: Daughter of the Lost Cause is the first published biography of this little-known woman who unwittingly became the symbolic female figure of the defeated South. Her controversial engagement in 1890 to a Northerner lawyer whose grandfather was a famous abolitionist, and her later move to work as a writer in New York City, shocked her friends, family, and the Southern groups who worshiped her. Faced with the pressures of a community who violently rejected the match, Winnie desperately attempted to reconcile her prominent Old South history with her personal desire for tolerance and acceptance of her personal choices. Seriously, could there be a better book for my sister to request (unless its one of my other 45 library recommendations)? You’re welcome Holly. Sight reading is something about reading music (for which I have no inclination). Site reading is the term I just made up for wanting to read about a particular place after visiting it. And, a forewarning, it’s about to get super nerdy in here (I should probably preface everything I ever say with that statement). I just finished a book that I really enjoyed, but it’s not necessarily one I would go around demanding that everyone read. 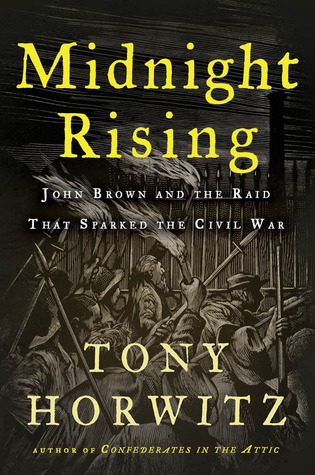 So instead of reviewing it, I wanted to talk about how I came to read Midnight Rising: John Brown and the Raid that Sparked the Civil War by Tony Horwitz. Let’s start here: I never really gave very much thought to reading non-fiction books for fun until embarrassingly recently. I don’t mean Jen Lancaster-style nonfiction, I mean reading books on history or science or or culture. In my head, there was a divide between “school” books and “fun” books. This, despite the fact that I generally thought school was fun (right up to the point where I decided grad school was no longer fun and left). Anyway, somewhere post-student-life I realized that I could read books about whatever I damn well pleased, and sometimes that means reading about teenagers in dystopian futures and sometimes that means reading about John Brown. If you’re still with me, I’ll try to connect that leap. Now that I’m the sort of person that likes to read about just about anything that interests me, I will look for books when I’m intrigued by a particular story. John Brown, the radical abolitionist, was not that story, or at least not the whole story. My partner-in-crime/fiancé and I lived in a small town in Kansas for a few years, and while we were there, we made it a point to visit just about anything significant within driving distance (we still do the same now, but our to-see list is longer in Virginia). One of those sites, naturally, was the John Brown museum in Osawatomie, Kansas. To me, the most interesting story told at the state historic site was that of Florella Adair, John Brown’s half-sister, who lived in Kansas with her husband. I’m still kind of obsessed with Florella, and unsatisfied with what I know about her. She was one of the first female graduates of Oberlin College, and she put up her half-brother and his band of men while they were running around (read: killing people) in Kansas, over her husband’s disapproval. Interesting, right? Anyway, after visiting the John Brown museum, I googled for books and didn’t find anything that jumped out at me, so I mentally filed that one away for another day. Then, just recently, we took a trip to Harper’s Ferry in West Virginia, the site of THE John Brown ill-fated raid. Thus, my interest in John Brown – and Florella – was reignited, and I googled again. I added this book to my To-Read list, especially after I realized the author, Tony Horwitz, also wrote Confederates in the Attic (which is pretty awesome). Midnight Rising is not light-reading, but it’s not overly dense either. Generally, if anyone (Dear J, don’t read this sentence) starts talking to me in military terms about who’s flanking who, I start thinking about what’s for dinner, but the descriptions of the raid are manageable. It helps that I visited the scene just months ago, and could *almost* follow along, though spatial and directional things are not really my forte. If you’re into this sort of thing – small history lessons, reading about people and places, nonfiction – then I definitely recommend this book. Any other site-readers out there have book recommendations?